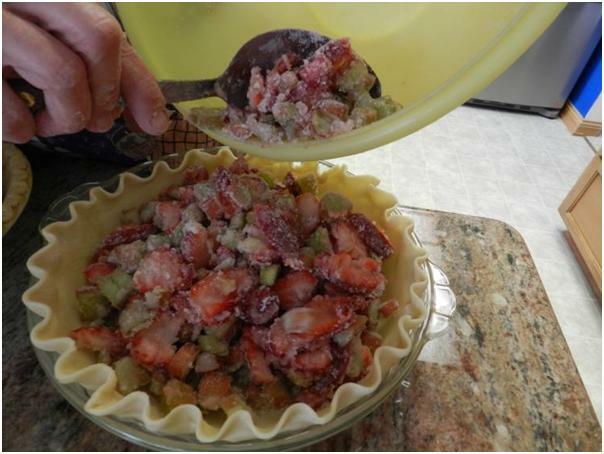 My mother made Strawberry Rhubarb Pie a few weeks ago and made the mistake of mentioning it to me on the phone. What she forgot was that my Dad would be driving to Pullman two days later. I spent those 48 hours campaigning for her to send “a piece” to me and reminding him. Really, I meant for her to send about half the pie but she sent me exactly one piece. I snuck it into the office and ate it all by myself without offering to share any with my family. So, maybe I shouldn’t be judging mom’s sharing technique especially after she went to all the trouble to make it again for our last night in Eastern Washington. I had just left Ric alone with the movers after a dresser being driven across the lawn on a dolly started losing all of its drawers into the grass. It’s just best for me not to watch some things, so I went up to Spokane where the boys were already staying with my parents. I got there just in time for the pie making, so I got out my camera. 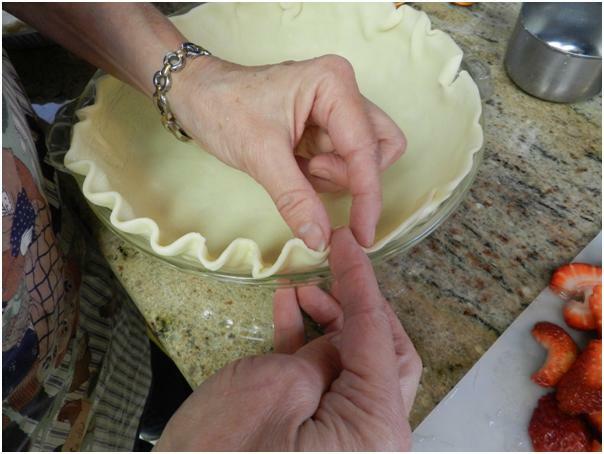 She was actually making three pies. 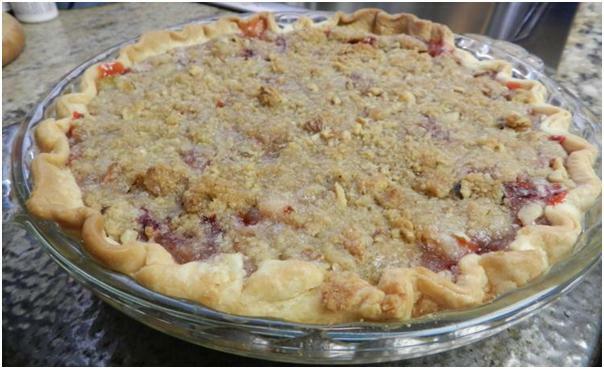 In my economy they were to be divided thus: one for me, one for everyone else and one for the neighbor who gave her the rhubarb. 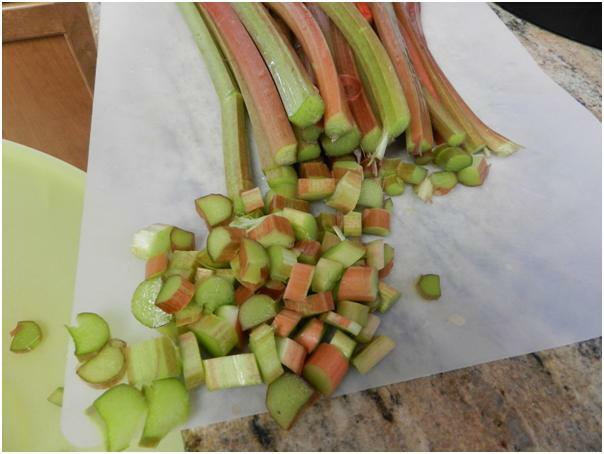 She had already started chopping the rhubarb by the time I set down my purse. 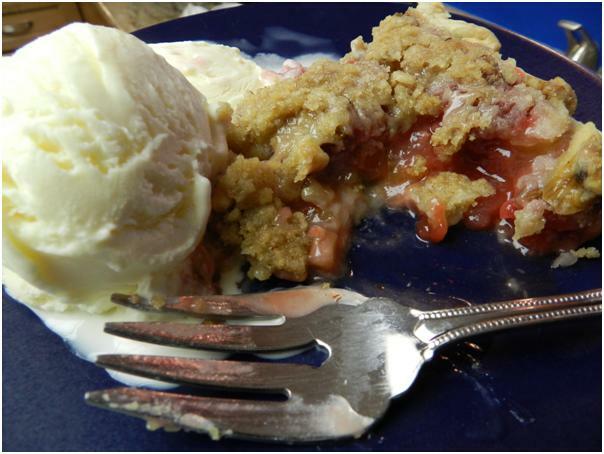 I liked the color of this batch and it packed a healthy rhubarb sizzle in every bite. 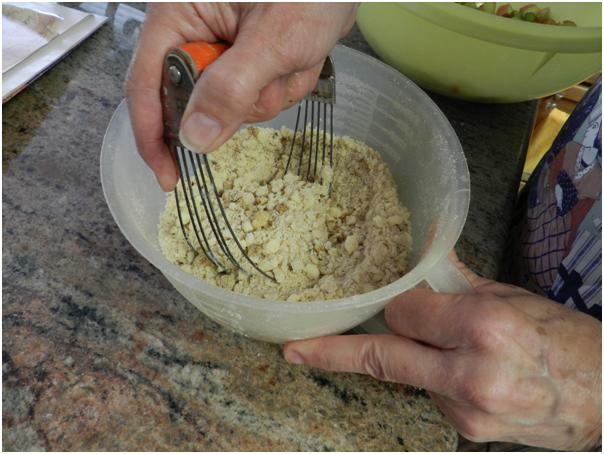 She also had the crumb topping ready, but I had her pose with the pastry mixer anyway. 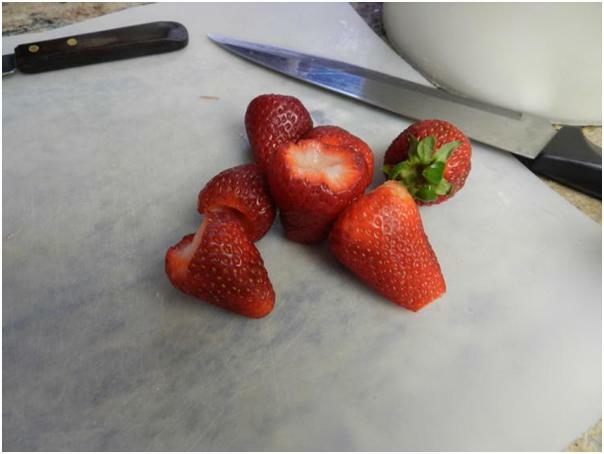 She let me slice the strawberries. 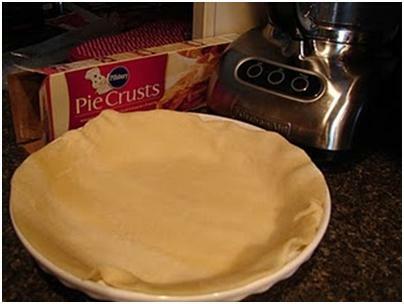 But, Mom took care of the crust. She is much better at shaping the edge than I am…so are most people. Then, she added the flour and checked in with the aged cookbook she got for a wedding gift from her grandmother, (my Great Grandma Quantz). She doesn’t really follow the recipe as much as she thinks she does though. I guess it just jogs her memory. 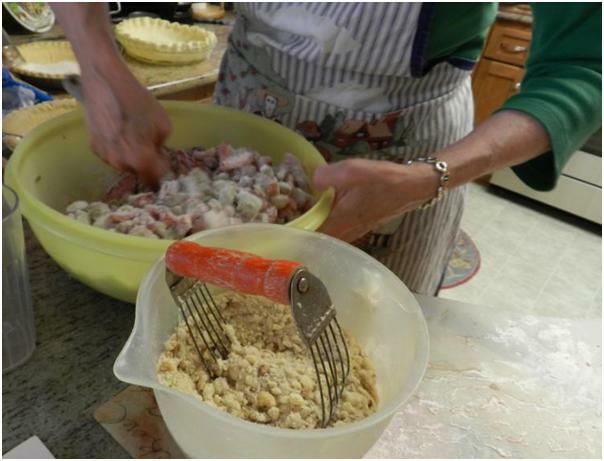 The recipe at the bottom of the post is how she actually makes the pie. 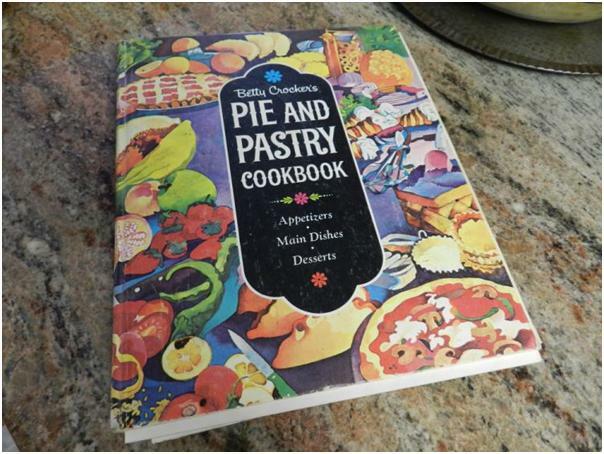 Here is the cookbook dated from the late 60s. It calls for “Regular Gold Medal Flour or Wondra” in most recipes. What is Wondra, I wondra-d? 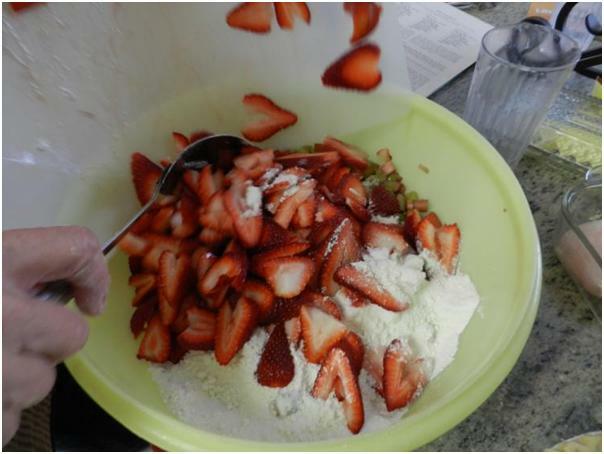 After the cookbook consultation, we dumped in the pretty strawberries. 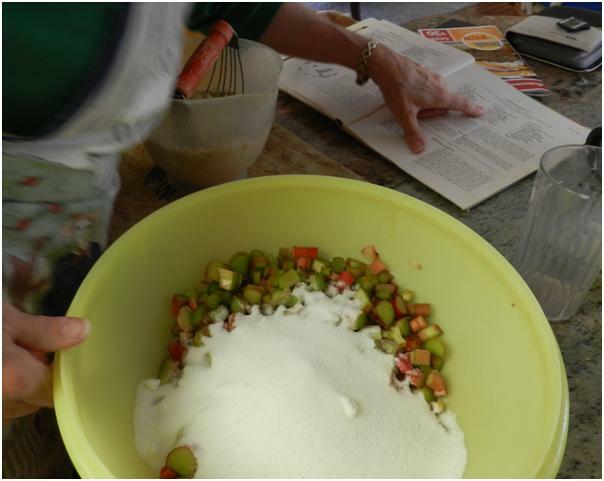 …and mixed the filling together gently. 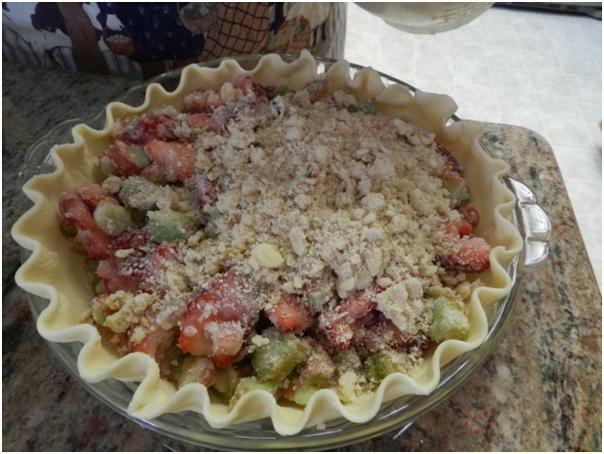 The filling is put into the crusts looking like a bunch of freshly sugared fruit. It was very pretty and I was surprised that was all there was to the process. I thought there would be a sauce involved for some reason. It certainly comes out of the oven differently than it goes in. 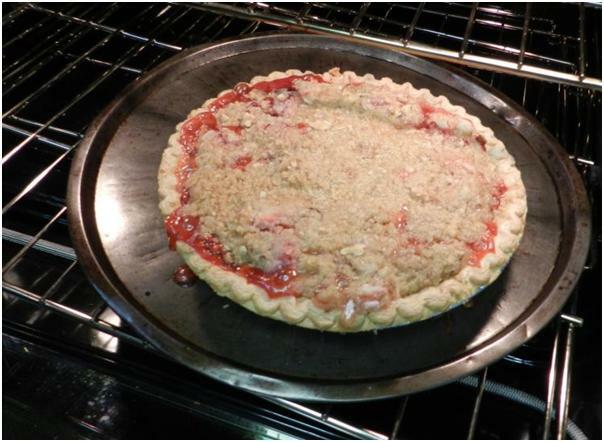 The crumb topping is Mom’s twist on the pie and I like it. 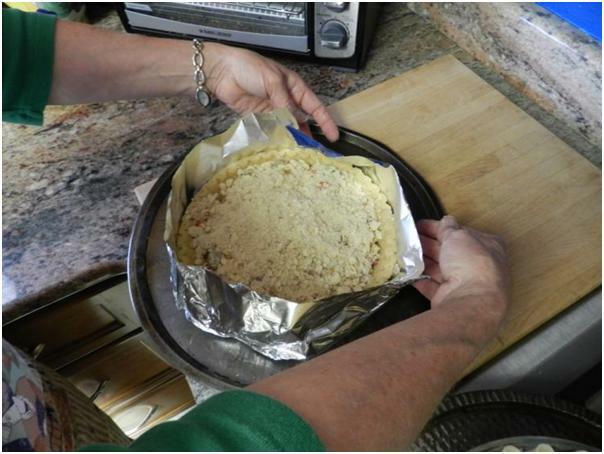 She puts a pan under each pan for the oven because there is a tendency to drip. 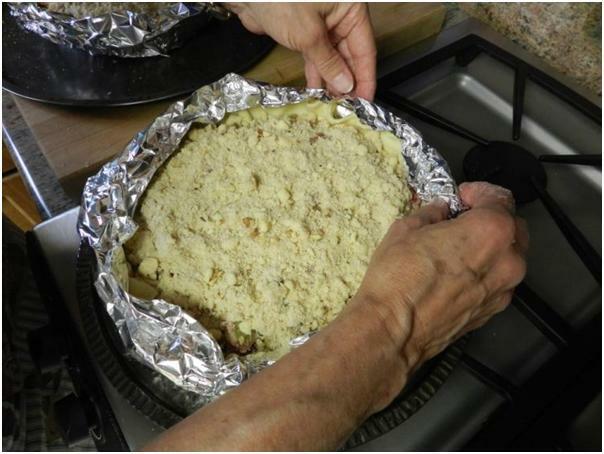 She also makes aluminum foil collars to keep the edges of the crusts from overbrowning. Three strips of foil folded together into one long strip and then turned into a loop and pressed around the edges. 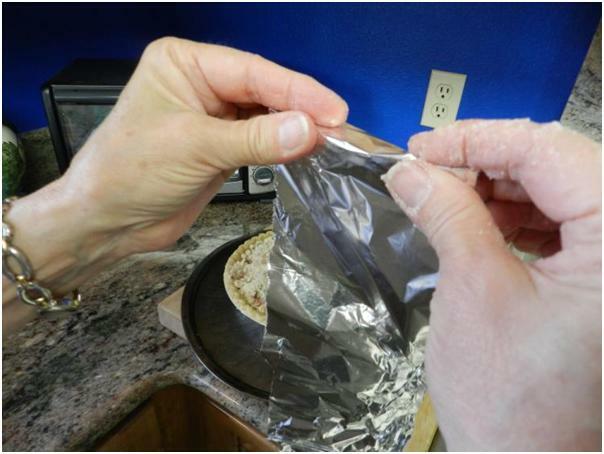 I have visions of cutting my fingers on the foil just thinking about this process, but it really does help on pies that have to bake for a long time. Here is my pie. It was yummy. I ended up sharing – which was Mom’s plan all along but Oh, My! It was delicious. I was so intent on the zingy goodness that I almost forgot I meant to post this culinary experience. So, final photo has a few bites missing from the side. Bake at 425 for 40-50 minutes until filling is bubbly. Let it cool and set before attempting to slice. I know this isn’t an end-of-March dish, but March has been full of November here on the Palouse, so we’re still wallowing in winter comfort food. This is one of our favorites for a bone chilling day. I start with the carrots first because they need time to cook. They get chopped with my usual imprecision and placed in a small sauce pan with plenty of extra water to simmer on medium heat while I work on the sauce. 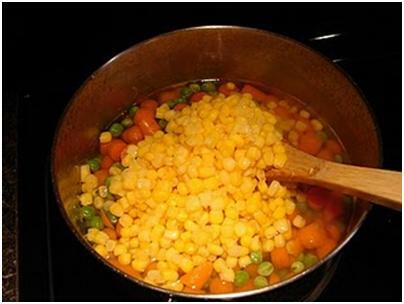 Later: When they are tender and the sauce is nearly done I dump the frozen peas and the drained can of corn in and bring the water back to a boil for just long enough to tenderize the peas and heat the corn. If you start them all at the same time, the green and yellow will be mush by the time the orange is tender. 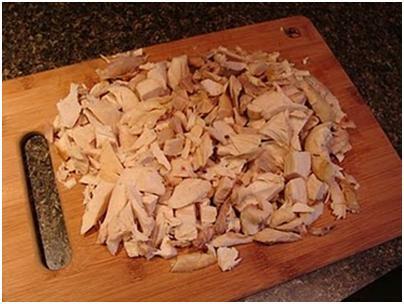 Next I chop the chicken. My favorite is a rotisserie chicken from the grocery store, but any chicken will do. The next step is to start the sauce. See All-Purpose White Sauce AKA “Cream-of-Whatever” for instructions. While the sauce is thickening, I start on the crust. I wish I could say I do this from scratch, but the truth is: I usually don’t. But I’m planning to get better about that. I’m not proud of the perfectly able bodied food processor next to the Pillsbury box. After spreading one of the rolled out crusts in the bottom of the pie plate, it’s time for some play-dough style fun – unless there’s a child on hand. Then I maintain my dignity and let them handle the next couple of steps. 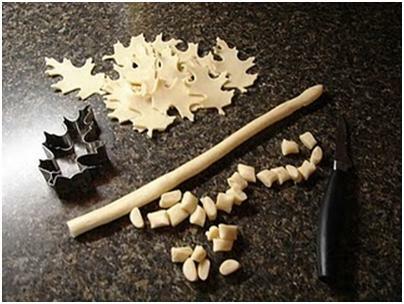 I (or the child) get out a cookie cutter and cut the dough into shapes, usually leaves. Then with the scraps that are left, we make snakes! CAUTION: Don’t let child helpers become emotionally attached to their snakes. The next step is to chop the snakes to bits and roll the bits into balls. 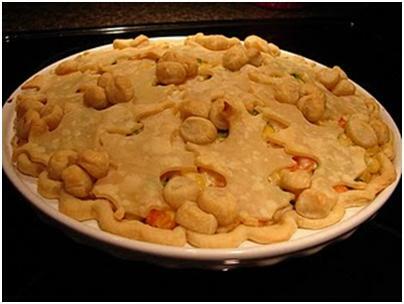 Those little balls turn out to be the stuff my family squabbles over when the pie is finished. 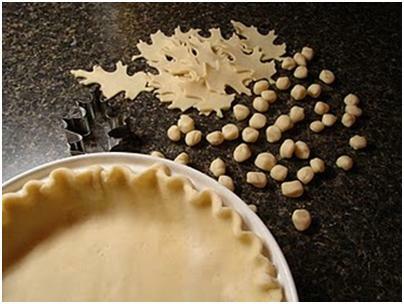 After all, who doesn’t like little balls of pie crust! 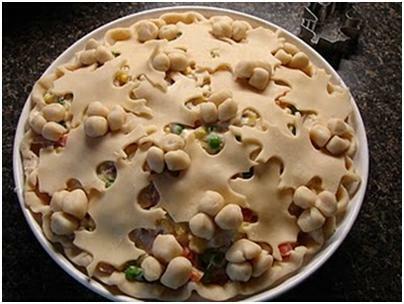 The trick is to keep dough lovers from eating them before they make it into the oven. The veggies and the sauce are about done by now. Turn the oven on to pre-heat at 375 degrees. 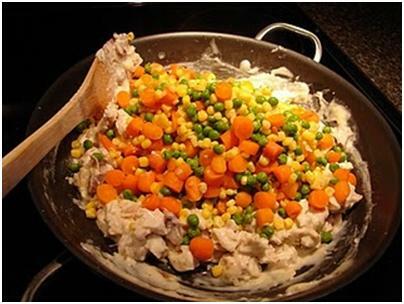 Stir the chicken into the sauce. Drain the vegetables thoroughly before adding them to the sauce. I let them stand and dry for 3-4 minutes in the strainer, because wet carrots and their friends can ruin the sauce you’ve worked so hard to thicken. 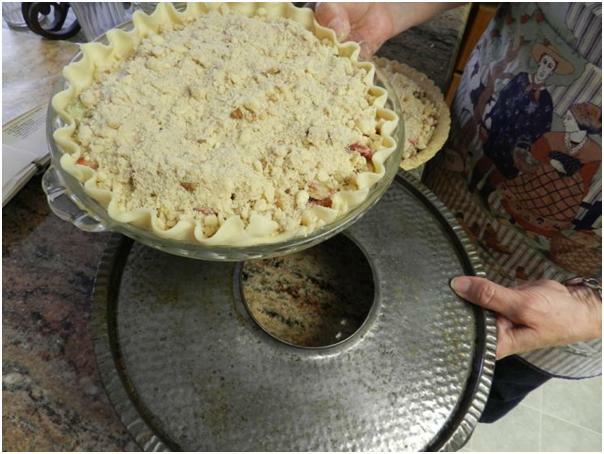 Bring the sauce back to steaming hot on the stove before filling the pie plate otherwise the crust will be soggy. 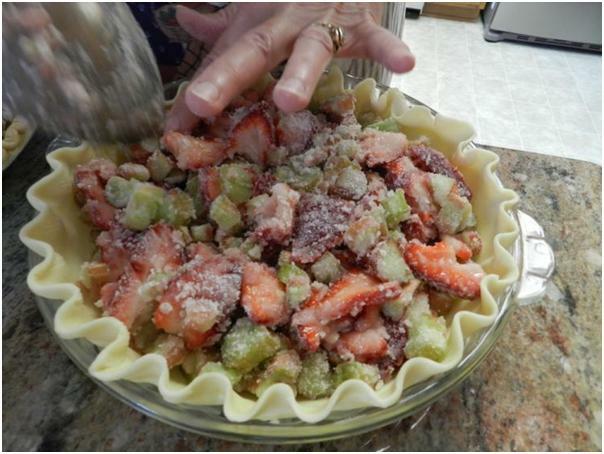 Arrange the fruit of your art atop the steamy filling. I like to group the little balls of goodness into threes. It looks pretty that way and it allows my children to practice skip counting while they’re making sure nobody got more than their “fair” share. 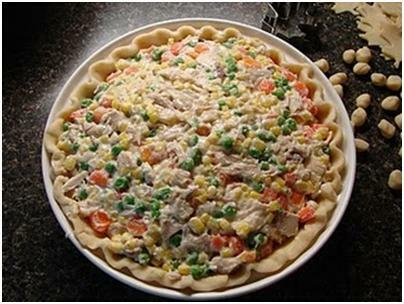 Bake at 375 degrees for 15-25 minutes until you like the look of the crust. If you like a really crispy crust you can bump the temperature up a bit. 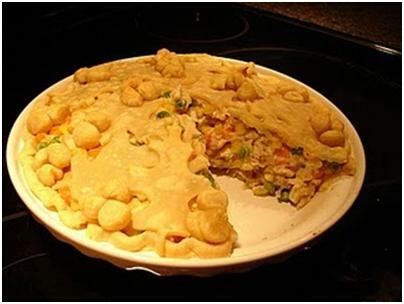 Not Perfect – but Very Tasty! This one probably could have used another 5 minutes or so in the oven, but it was already about 7:00PM and the boys were circling the kitchen like piranhas. It was better to sacrifice blogging perfection than keep them waiting any longer.